We visited Cambridge relatives last weekend and While I was there I noticed a really good tea-towel, neatly washed and pressed and in use to protect an appointments book from muddy cat prints. (It’s in a nice sunny sitting place). Hmmm… I thought, that’s an interesting pattern. 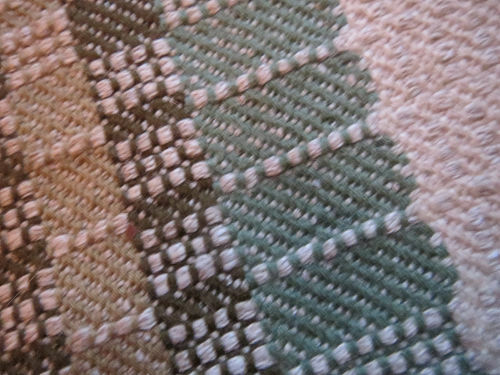 The yarns looked familiar though – I still have cones of those cottons and linen, in those colours! It must be one of mine. However I have no recollection of weaving it all. I took pictures and have spent the last week going through my notes (nothing there) and my books and magazines …. ditto. Bother, I’d like to repeat that, so I’ll see if I can figure out the pattern! 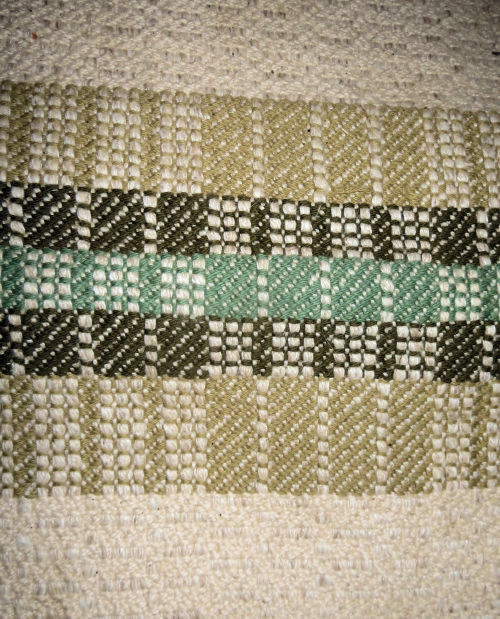 Looks like there are 2 blocks and it has to be do-able with 8 shafts, since it would have been woven on the old loom, or my table loom. 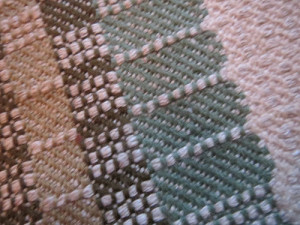 Both blocks have to weave as 3-1 twill, but not at the same time :-). When the first is weaving twill the other seems to have 3 threads up for 3 picks, then 1 pick reversed. 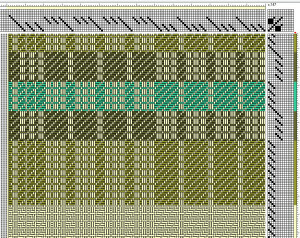 Fir e up the weaving software (Fiberworks Bronze) and start experimenting. Ta-da!!! Now I just have to work out a sett and weave it. (I should have put something on the photo to scale, but it’s probably best to go back to the yarns and work it all out again. 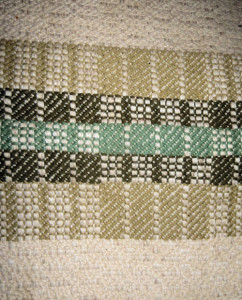 Hi, you are very talented to be able to weave tea towels. I just sell them. best, Al. I wouldn’t dare add up the hours of work for the sake of a dozen teatowels!